Blasim and Ra Page—the founder of Comma Press, which originally published Iraq + 100 in England—envisioned a mosaic of tales that projected Iraq’s entire present and past into an uncertain tomorrow. 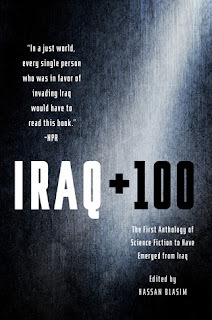 Page states in his afterword, “The best science fiction, they say, tells us more about the context it’s written in than the future it’s trying to predict.” Blasim has also pointed out the relative lack of technological innovation in Iraq throughout the last century as a perception he hopes to counterbalance. Baghdad is where algebra, the decimal point, and the first method to calculate the radius of the Earth were invented in ancient times—and Iraq, Blasim feels, is a rightful heir to the sci-fi tradition. Accordingly, the stories in Iraq + 100 ripple with speculative energy. Written by authors who range in age and style, the tales take place in the cities of Baghdad, Basra, Mosul, Najaf, Ramadi, and Sulaymaniyah—all are set in the year 2103, a century after the U.S. invasion. In “The Worker” by Diaa Jubaili (translated by Andrew Leber), Basra has continued to be ruled by a succession of tyrannical theocrats, the latest of whom has overseen a wave of famine, human trafficking, and even cannibalism. Using history to twist the present, the dictator spouts a perverse moral relativism—all while his citizenry scratches for survival amid the ruins of lost technology. In the author Khalid Kaki’s vision of 2103, a Chinese city-state has arisen on Iraqi soil. It’s a classically Orwellian dystopia, where a charismatic yet brutal leader—in this case, Gao Dong, the Beloved Benefactor—has installed himself as a godlike giver and taker of good fortune. Gao Dong’s greatest weapon, like Big Brother’s in 1984, is his dominion over language. 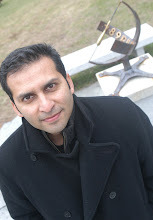 All citizens must speak Chinese, and the region’s ancient tongues—Syriac, Arabic, Kurdish, Turkmen—have been banned, and a government department called the Memory Office serves to “protect the state’s present from the threat of the past.” Rashid Bin Suleiman, or RBS89, as the government has renamed him, works alongside hovering droids as a cog in the Memory Office’s apparatus. His job is to dig up computers, compact discs, or any other means of information storage that might alert the populace to Iraq’s former sovereignty. That is, until he comes across an old folk song that radically shifts the way he sees himself and his world. “Operation Daniel” also yields one of Iraq + 100’s most indelible lines. There’s an underground resistance movement struggling within Gao Dong’s dictatorship, and one of their slogans is “History is a hostage, but it will bite through the gag you tie around its mouth, bite through and still be heard.” It’s just one way the story (translated by Adam Talib) is rendered poetically. During his work, RBS89 unearths “glittering discs or dull cuboids with spindles of tape inside,” as if he were a treasure hunter in some futuristic version of One Thousand and One Nights. Even Gao Dong’s favored method of execution—which he calls “archiving,” a process where language offenders are incinerated then turned into diamonds, whose crystals audibly reverberate with their memories for eternity—elevates the tale from cautionary to sublime. 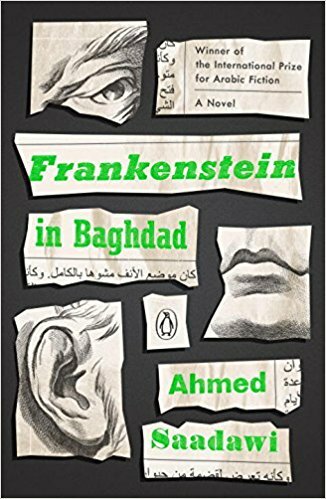 A winner of the International Prize for Arabic Fiction, Frankenstein in Baghdad (translated by Wright) startles and stuns. Hadi Al-Attag is a scavenger who scours the streets of Baghdad during the U.S. occupation, subsisting on whatever he can find. His conscience compels him to undertake a ghoulish project: gathering body parts from the casualties of war, terrorism, and sectarian violence, then stitching them together into a hideous sculpture of flesh. The book’s speculative element arises when Hadi’s monster disappears, just before a rash of murders erupts throughout the city. people. “Since it is made up of parts taken from Iraqis of different races, sects and ethnicities,” he said, “the what’s-its-name represents the complete Iraqi individual. In other words, the what’s-its-name is a rare example of the melting pot of identities. Iraq has suffered from this chronic problem ever since it was established early in the 20th century.” Like the best science fiction, fantasy, and horror, Frankenstein in Baghdad—a patchwork of all three genres as formidable as Hadi’s own creation—stretches the fabric of logic. In that distortion, hidden truths emerge. Eventually the what’s-its-name transcends its atrocities to become worshipped by the masses, a parallel to the rampant populism that has resulted in the kinds of dictators that are by no means restricted to Iraq. Saadawi depicts his creature’s patchwork composition as both a strength and a curse, driving home the idea that collective identity can either heighten or suppress the individual, and that those in power often wield such distinctions for their own political benefit. The astrologers begin manipulating playing cards in order to divine the whereabouts of the creature—a clash of superstition, science, and the supernatural that Saadawi uses to highlight Iraq’s internal struggle between the past, the present, and the future. The creature’s response to such arcane efforts calls to mind the brooding fatalism of Shelley’s own wretch: “The cards don’t matter. What’s important are the hands that dealt them. Read the full article here. And these two books look fantastic!